#NASAInKiambu ; "I'm not an enemy of Kikuyus as perceived by Jubilee party, I will protect any property." Says Raila Odinga in Kiambu. #RailaInKiambu - Bana Kenya News, Real African Network Tubanane. Raila Odinga visited Jubilee Bedrock in Kiambu county. This comes after Jubilee, on the other hand, visited the Eastern region. Raila Odinga said that he has no grudge or anything negative with Kikuyus. He said that there hard earned efforts will be safe and secured in his reign. 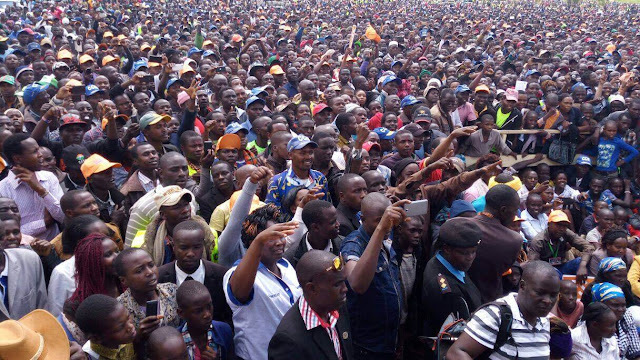 Odinga who made his first vote-hunting visit to Kiambu County since being cleared to run for the presidency by the Independent Electoral and Boundaries Commission mid-May said he remains committed to working with all Kenyans. Citing a similar working relationship in the past including when he supported retired President Mwai Kibaki in 2002, Odinga said he will work closely with the Kikuyu should he win the August 8 vote. “I said Kibaki Tosha in 2002. Do you really think that I did not know then that Kibaki was Kikuyu? Even when he was involved in a road accident I took over the responsibility of campaigning for him,” the ODM presidential candidate said. “I, therefore, want to tell you today that I Raila Odinga; I am the friend to the Kikuyu community. So members of this community are at the heart of our alliance – NASA (wako ndani, ndani, ndani ya NASA),” he added. The NASA leader said he intends to create facilities where youths will be trained before being given grants which they will use to start their own business ventures should he win the presidential election. “We want to follow the Chinese and Malaysian example where we will train youths before giving them grants to start their business,” Odinga promised. Today's meet-the-people tour of Kiambu provided for reflective moments on the Kenya we want and the future we seek for ourselves and our children. From Limuru, Gitari, Wangige, Ruaka, Kiambu, Ruiru, it's clear that the pain of our economic collapse on families and businesses is acuter than we see in the media. Kenyans are asking for true leadership that will mend fractured relations, revive our economy and restores our sense of community. A leadership that understands Kenya is bigger than any single person or any single community. A leadership and a country that leaves no one behind. "Thank you, Kiambu for the amazing warmth. I hear you and feel you. Let us do this together. Tuibadilishe Kenya pamoja. #NaneNane " Said, Odinga. Odinga, who served as premier in the 2008-2013 Coalition Government with Kibaki said the solution to youth unemployment lies in eliminating bottlenecks that impede efforts by youths to secure business loans. Before embarking on his tour of President Uhuru Kenyatta’s home turf, Odinga held a press conference at his Capitol Hill office where he disputed claims that he was a dictator. During the presser, Odinga assured Kiambu residents that he would work tirelessly as president to protect their socio-economic interests of people in the larger Central region, saying they too have a right to prosper in an all-inclusive country. The Opposition leader said he supported Kikuyus all the way from 1992. He has rescued SK Macharia on his Royal Media house when Moi wanted to close it. He also campaigned for Mwai Kibaki in 2002. He also assisted in the building of Tea factories in Central Kenya and the Thika super highway. He added that in his presidency he will rehabilitate all the roads and other infrastructure in the region.